Web analytics outfit StatCounter last week trumpeted news that Windows 10’s market share overtook Windows 7’s for the first time in January 2018. But other ratings services didn’t find the same result. 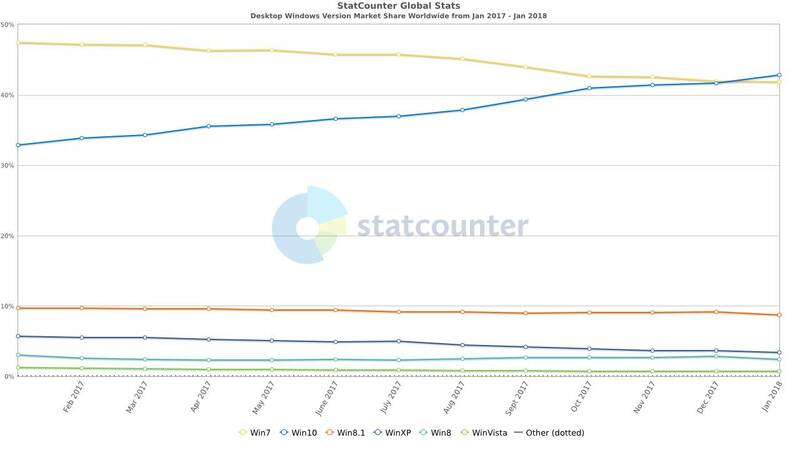 StatCounter’s assessment of Windows version market share for January 2018 suggested that Windows 10 scored 42.78 per cent of Windows’ market share, as measured by worldwide internet. That compared to 41.86 per cent for Windows 7. Here’s a pretty graph showing the trend. Before you figure out how to start selling champagne to Microsoft offices, consider that StatCounter has a rival named Netmarketshare and that its January 2018 data has Windows 10 on 34.29 per cent market share, well behind Windows 7’s 42.39 per cent. Which is more accurate? That’s hard to say as both are ultimately black boxes. What we can say with some certainty is that if StatCounter is right, Microsoft has taken two-and-a-half years since Windows 10’s July 2015 launch to beat a product launched in July 2009. Previous Ballmer once yelled: Developers, developers! Today it would be: Docs! Support! Certificates!